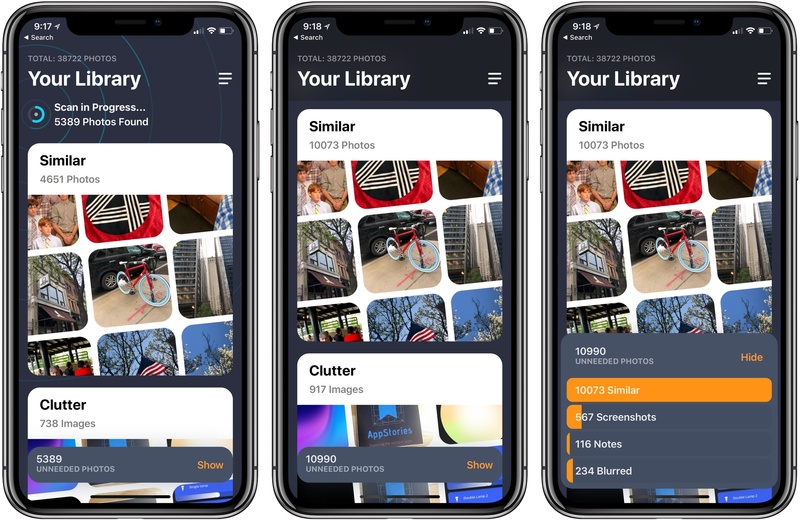 MacPaw has released a brand new iPhone app that takes the ideas from Gemini 2, the company’s duplicate file finder on the Mac, and applies them to your iOS photo library. Gemini Photos uses an algorithm to analyze your photos that suggests the ones you should consider deleting. With photo files getting bigger with each improvement of the iPhone’s camera and features like Live Photos and burst mode, a utility like Gemini Photos can save significant amounts of space on your iPhone. Gemini Photos is a subscription-based app. Before you can start using it, Gemini asks you to pick a monthly ($1.99/month) or annual ($11.99/year) plan, both of which come with a three-day free trial. After you sign up for a plan, Gemini Photos automatically scans your photo library. Alternatively, you can purchase Gemini Photos for a one-time payment of $14.99. Depending on the size of your library, the initial scan can take a while. I have over 38,000 photos, which took about 17 minutes to scan, made my iPhone X get warm, and noticeably drained its battery. I uninstalled the app, restarted my iPhone, re-installed, and went through the initial scan process again, which took 12 minutes the second time, so your experience could vary. After that initial scan though, subsequent rescans of my library were measured in seconds rather than minutes. 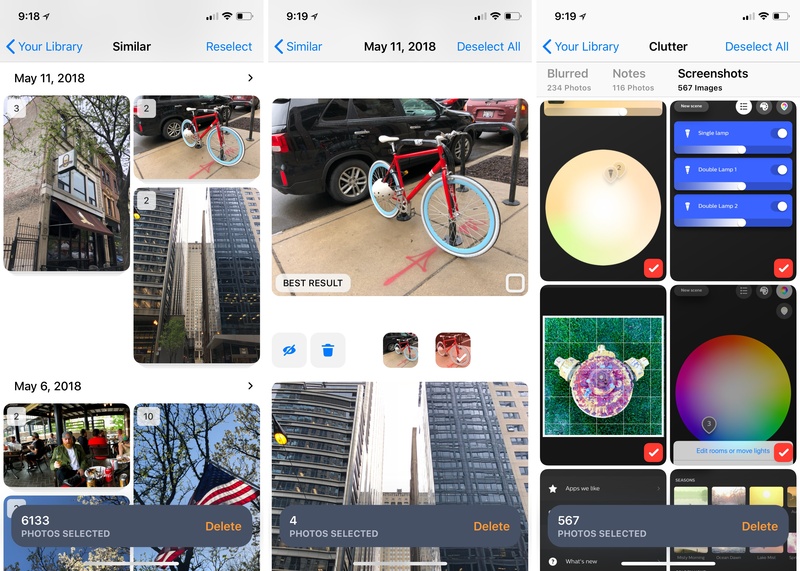 Gemini Photos suggests two categories of photos you might want to delete: Similar and Clutter. I like the design of the app’s main ‘Your Library’ screen a lot. It’s simple and clear with a card-like UI for each of the two categories that includes a grid of thumbnails of some of the photos the app has identified. At the bottom of screen is the total number of ‘Unneeded Photos’ and a button that reveals a breakdown of the total by category. Browsing similar photos (left and center) and screenshot clutter (right). Tapping either card takes you to a detail view where you can browse the photos and decide whether to go with Gemini’s suggested deletions or make adjustments. Tapping a set of similar photos lets you swipe between each to decide which to discard, and long-pressing a photo reveals the share sheet that you can use to send the image to another app. It will come as no shock to people who know me that I don’t do much to manage my photo library. As a result, Gemini identified over 11,000 ‘unneeded’ photos between the two categories. By far the biggest category, at over 10,000 photos, was the images the app flagged as similar. Overall, I was happy with the results, though it’s important to keep in mind that similar images are not duplicate images. As a result, I wouldn’t suggest deleting all similar photos without looking at them first. When I reviewed the similar section of Gemini, I found photos that I didn’t want to delete. For example, a photo of a building and a selfie from the same angle with the same building in the background. Also, for some special events, I’d rather keep all the photos I took for sentimental reasons, even if they are similar. The Clutter section of Gemini is divided into three subcategories: Blurred, Notes, and Screenshots. Of the 900 photos in my library that Gemini detected as clutter, 234 were blurry, 116 were notes, and 550 were screenshots. With a few exceptions, I mass-deleted the screenshots and blurry photos. One false-positive I noticed in the blurry category were photos that were predominantly of the sky with clouds. Notes tended to be images of business cards, grocery lists, and other text, though Gemini did inexplicably identify a few photos of columns and statues from a trip to Rome as Notes. Although I found some images in the Clutter section that shouldn’t have been included, the rate of false-positives was low enough that the utility of the app was not meaningfully affected. For now, Gemini Photos is iPhone-only. I’d like to see it come to the iPad, which would make visually scanning through a large library faster. I’d also like Gemini Photos to add video support to cull those inevitable short, blurry videos that I take by accident from time to time. Despite some false-positives, I’ve found Gemini Photos to be a great way to quickly eliminate junk from my large, poorly-managed photo library. It’s one of those single-purpose iOS utility apps that makes an otherwise tedious task much more palatable. I'm not sure about Gemini's subscription business model though. Gemini Photos strikes me as the sort of app that most people will use only occasionally and won't want to pay for every month. Of course users can always subscribe for a month and then cancel the subscription, resubscribing the next time they need to use the app, but that's not ideal because it requires users to remember to unsubscribe to avoid auto-renewal. A one-time payment of $14.99 is also a steep price compared to other photo utilities. However, if you weed out your photo library regularly or only occasionally, but are willing to do the subscribe/unsubscribe dance, Gemini Photos is worth a look. Gemini Photos is available on the App Store.